Organizational resources go beyond money and people; resources are rooted in organizational capabilities. And almost everything can represent an organizational capability when assisted by a great team of knowledgeable individuals who are experienced in business and management acumen. USL has the following team of excellence appointed to guide and show direction to the organisation. 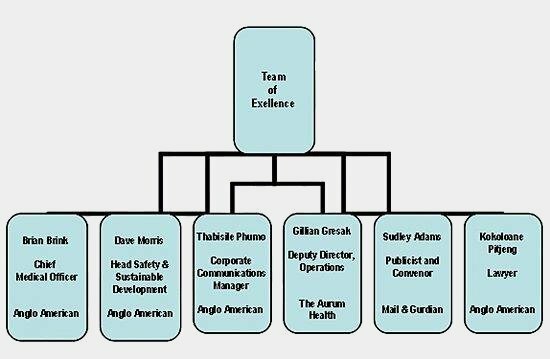 Members of the team of excellence have their full-time positions in respective organisations / companies. 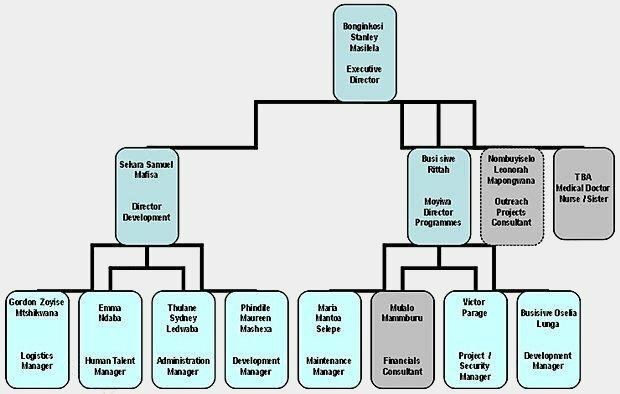 USL Consists of top 3 management personnel making up the Board of Directors - whereby the two (2) directors report directly to the Executive Director and the Chairman of the organisation. Management Team of USL is made up of 8 personnel reporting to either the Developments Director or the Programmes Director. The Outreach Projects Consultants and the Medical Doctor are critical positions reporting directly to the Exceutive Director. Click on name of staff to see the profiles of our staff and how to contact them directly. Bonginkosi Stanley Masilela the founder of uSizo Lwanamuhla was appointed Executive Director and Chairman of the organisation in July 2010. Bonginkosi was previously a Global Category Specialist of Anglo American South Africa when he founded uSizo Lwanamuhla. He is past Global Superintendent Procurement Specialist of Gold Fields International and currently a Procurement Manager of Hernic Ferrochrome. In 1993 Bonginkosi graduated as a traditional health practitioner at a t/Dr. Mantanzi Nyembe ukuthwasa school in Alexandra, as a traditional health practitioner he has worked with all types of clients/patients in South Africa as well as nearby countries - Lesotho, Zimbabwe and Swaziland. Sekara Mafisa has been with uSizo Lwanamuhla from the beginning since he was the co-founder and was appointed Development Director for organisation in July 2010. He has completed advanced trainings in relation to HIV/AIDS. Sekara has worked in community work in his home town in Botha Bothe in Lesotho for Africa Live Organisation. Sekara has worked in the SME department for the City of Johannesburg, and was one of the personnel who made the Soccer FIFA 2010 possible and enjoyable for the globe. With the leardership that that he has as the youngest Director of uSizo Lwanamuhla he has helped collegues progress in reaching their dreams in the organisation. He has been working closely with Gender Dynamix on gender equility, sexual health and reproductive health projects as well as indegenous people o those of western ways. Sekara is also a qualified traditional health practictioner. As a Development Director, Sekara is responsible for overseeing the programs and projects that the Board of Directors has directed to be implemented. He has overall responsibility for ensuring that the programs and projects of the Board of Directors are implemented in a professional and timely manner. The unique economic and social business climate is continously applied by Sekara to have a working knowledge of the various regional, provincial, governmental and national programs which may be utilized to help further the goals of uSizo Lwanamuhla. Nombuyiselo Leonorah Mapongwana was appointed Programmes Director of the organisation in July 2010, and has been heavily involved with uSizo Lwanamuhla in achieving its goals and objectives. Due to the commitment as an HIV/AIDS activist employed at Anglo American as and AIDS Policy Unit Manager whereby she educates and counsells the Anglo American employees about the disease; she is currently the Outreach Projects Consultant (appointed February 2011) of uSizo Lwanamuhla and sits as a board member, committeed in success of the organisation. Nombuyiselo is also passionate about general health issues and has helped a lot of people look beyond AIDS as a disease by encouraging them to test early so they can manage the disease. She uses her role as an educator to create awareness and influence others to improve their lives by changing mindsets and behavioural attitudes around HIV/AIDS. Her activities outside her scope of work are vast; she continues to reach out to others by giving doing one on one counselling at homes and still does a lot of motivational talks at schools and mines. Nombuyiselo has been involved in the The Anglican Church�s AIDS ministry, on their youth programmes. She has also co-authored a learner book title �Thembi�s story and other autobiography. It�s a book that chronicles the lives of the 31 people infected and affected by HIV/AIDS and their ages range from 13-80, crossing a broad spectrum of classes, cultures and races as well as attitudes to and knowledge of the virus and AIDS. The book is published by McMillan Education SA. Busisiwe Moyiwa was appointed Programmes Director in February 2011, and joined uSizo Lwanamuhla in July 2010 as a Financial Manager. After more than 20 years of experience in the financial industry at ABSA Bank head office. She has been spending her time in focusing on the commercial and financial aspects of uSizo LWanamuhla. As a programme director she ensures that the organisation operate as high performing virtual teams with good quality communication structures. As a qualified traditional health practitioner she has the skills of coaching, leading, mentoring and training in order to create a valuable and sustainable organization. She is a full and equal member of the Board of Directors which requires her to consider key strategic and managerial issues to ensure that uSizo Lwanamuhla meets its commitments set out in the terms of the governing constitution. Making sure that the organisation has the highest standards of honesty, integrity and governance is one of the key role that Busisiwe plays. Busisiwe has real enthusiasm for start-up�s and new initiatives, of which uSizo Lwanamuhla will have a fair share over the next years to come. The initiatives include various programmes offered to the community whereby planning, executing, and finalization of projects according to strict deadlines and within budget are met. The Outreach Projects Consultant works closely with Busisiwe in defining the project�s objectives and oversee quality control throughout its life cycle by providing an oversight of program management activities and assists with financial management, fundraising activities, public relations and coalition development.